Windows makes it possible to change the welcome screens that appear when you start your computer to just about any image you want to use. It’s easy to do in Windows 8 and 10, but fairly well-hidden in Windows 7. In Windows 8 and 10, you actually see two different screens at sign in. The first is the lock screen—the one you have to click or swipe to get out of the way so you can sign in. The second is the sign in screen itself where you enter your password, PIN, or picture password. You can change the lock screen background through a simple setting, but you’ll have to dive into the Registry to change the sign in screen background. 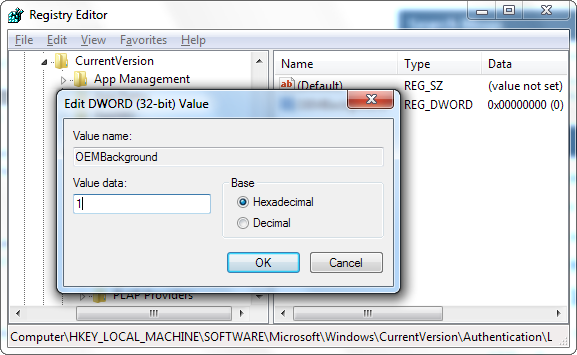 In Windows 7, there’s only one sign in screen and you’ll have to enable a custom background for it in the Registry (or through Group Policy) before you can select a new background. Windows 8 and Windows 10 make customizing your lock screen easy—all you have to do is head to Settings > Personalization > Lock Screen. The screens look slightly different in Windows 8 than they do in Windows 10, but they’re the same settings. To change the sign in background to a solid color, you’ll need make a quick edit the Windows Registry. To change the sign in background to a custom image, you’ll need to grab a third-party tool named Windows 10 Login Image Changer. And again, we suggest reading our guide for the full instructions. 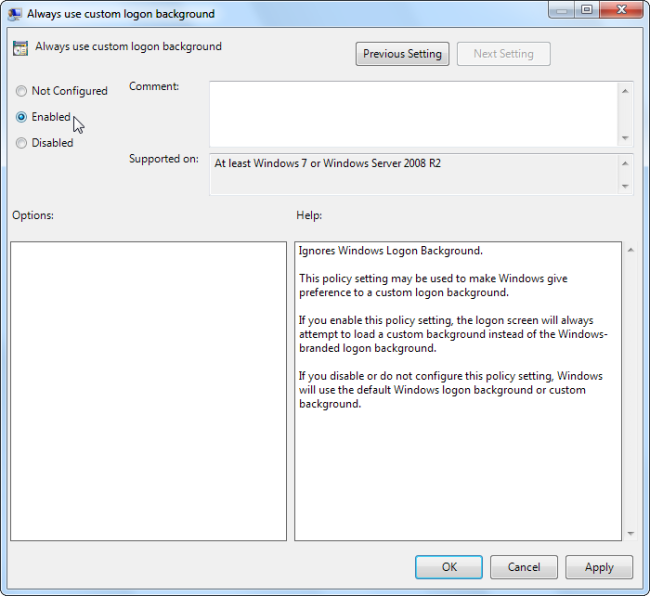 To use a custom login background in Windows 7, you’ll need to take two steps. First, you’ll make a Registry edit that enabled custom backgrounds, and then you’ll store the image you want in a special Windows folder. We’ll also show you a third-party tool you can use as an easier alternative. For Windows 7, the ability to set a custom logon background is intended for original equipment manufacturers (OEMs) to customize their systems, but there’s nothing stopping you from using this feature yourself. All you have to do is change a single Registry value and then put an image file in the correct location. 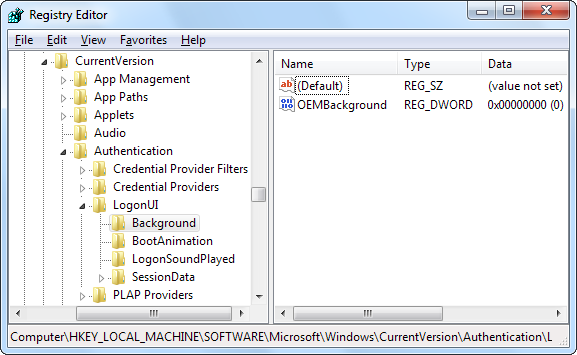 This feature is disabled by default, so you’ll have to enable it from the Registry Editor. You can also use the Group Policy Editor if you have a Professional version of Windows—we’ll cover that a bit later in this section. Launch Registry Editor by hitting Start, typing “regedit,” and then pressing Enter. Note: If you at any point select a new theme in the Appearance and Personalization window, this will reset this registry value. Selecting a theme will change the value of the key to the value stored in the theme’s .ini file—which is probably 0. If you change your theme, you’ll have to perform this Registry tweak again. If you have a Professional or Enterprise edition of Windows, you can make this change using the Local Group Policy Editor instead of in the Registry. 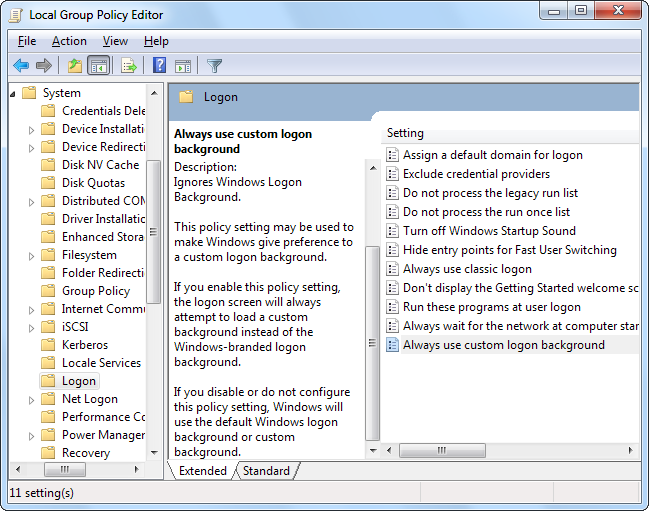 As an added bonus, changing the setting in group policy allows it to persist even when you change your theme. Launch Local Group Policy Editor by pressing Start, typing “gpedit.msc,” and then hitting Enter. 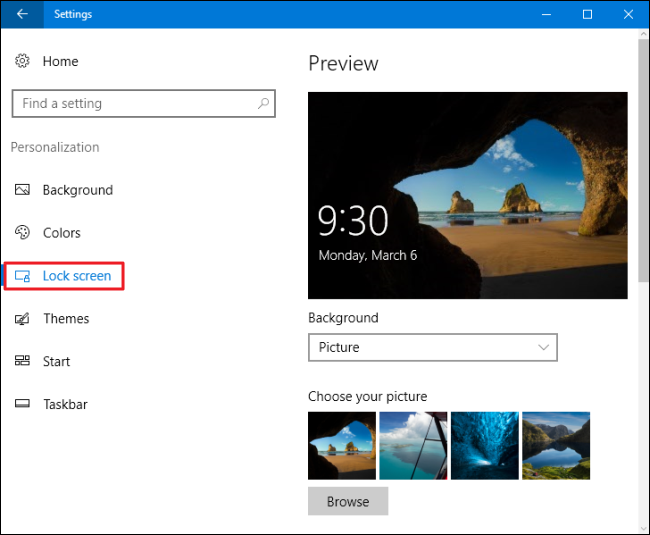 Whether you enabled custom background images by editing the Registry or using Local Group Policy Editor, your next step is to actually set the image you want to use. Your image must be less than 256 KB in size. You may need to convert your image to something like JPG format to make that happen. Try to find an image that matches the resolution of your monitor so it doesn’t look stretched. 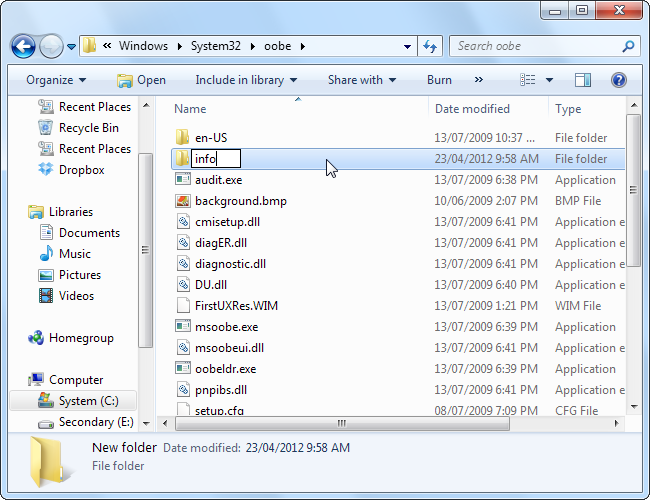 By default, the “info” and “backgrounds” folders don’t exist, so you’ll need to navigate to C:\Windows\System32\oobe folder and create the subfolders yourself. Note: If you’re interested, the image we’re using comes from here. The change should take effect immediately—no need to restart your PC. The first time you log out or lock your screen, you’ll see your new background. You don’t have to do this by hand. 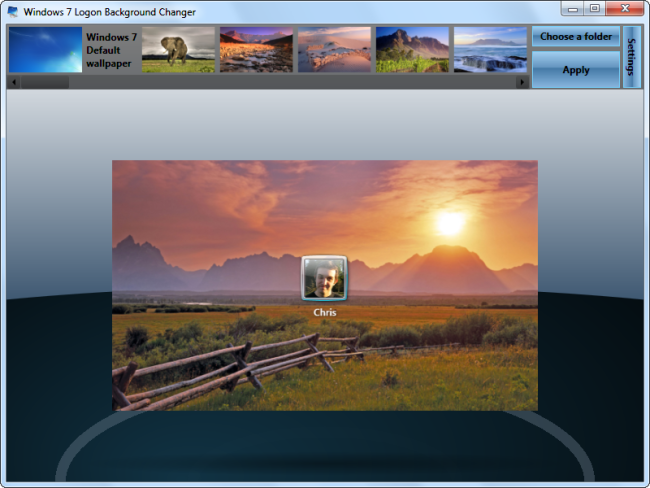 There are a variety of third-party tools that automate this process for you, like Windows Logon Background Changer, which we’ve covered in the past. Windows Logon Background Changer and other utilities just change this registry value and put the image file in the correct location for you. 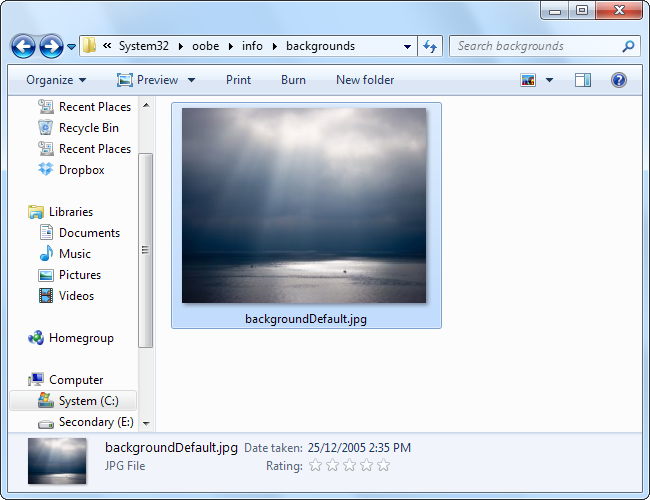 To get the default logon screen back, just delete the backgroundDefault.jpg file. 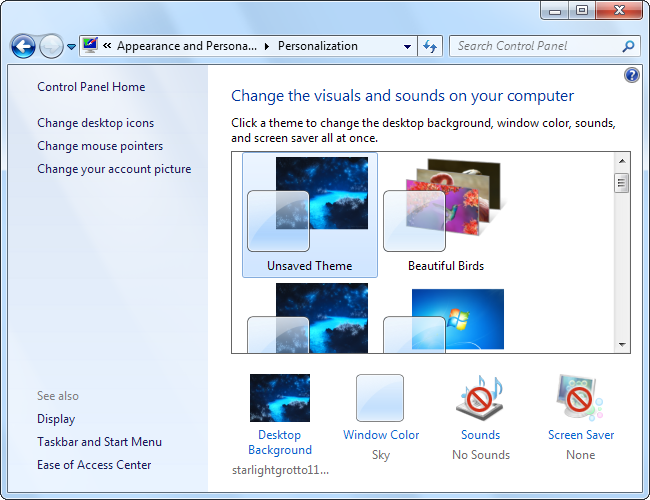 Windows will use the default background if no custom background image is available.